The Army Marksmanship Unit held the 2019 All Army Small Arms Championships March 10-16 at Fort Benning. The training event was open to all Department of Army personnel and consisted of a mix small arms skills. Lt. Gen. Charles Luckey, Chief of the Army Reserve, has stated his vision of developing the most lethal, capable, and combat-ready Federal Reserve force in United States history. That can only happen when Reservists can demonstrate skill beyond elementary basics such as qualification. 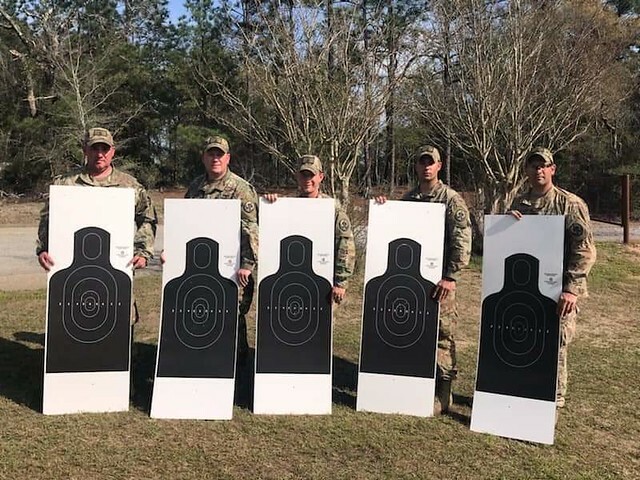 Army Reservists from the marksmanship community demonstrated their ability to implement the CAR’s vision by winning numerous events among personnel from all branches and components of the Army. A team from Army Reserve Careers Division led by Sgt. Maj. James Mauer was the highest scoring for the entire event. Firing members included Sgt. 1st Class Daniel Horner, Sgt. 1st Class Charles Parker, Staff Sgt. Rafael Fuentes, and Sgt. Joseph Hall. This team was also second place for the Rifle and Pistol team aggregates. Individually, Reservists also won a number of events. Sgt. 1st Class Daniel Horner was the high overall individual, doing so by also taking first place in the Multigun event. Sgt. Christopher Liming of the 85th USAR Support Command was first place in Pistol overall and the National Match Course (Match 27) event. Staff Sgt. Sandra Uptagrafft of the 98th Training Division took first place among non-distinguished shooters in the Excellence In Competition pistol event (Match 221) and Maj. Thomas Bourne of the 80th Training Command was first place in the Director’s Pistol Match (29). This entry was posted in Public Affairs Program and tagged #AmericasArmyReserve, #KeepPounding, #RoadtoAwesome, #USArmyReserve, All Army, FY19-summary.